California Winter: While it is true that we do not experience winter like they do in other parts of the country, when the thermometer dips into the 40s at night it feels like winter to me! 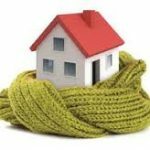 The article below has some very good and practical tips to help keep your home warm. Change The Filter: One tip that is missing from the list below is to change the air filter in your home’s heating and AC unit to maximize efficiency. The filter is typically very easy to change and a replacement filter is relatively inexpensive at most hardware stores and home centers. With winter here, many people are thinking of ways to keep themselves and their home warm without cranking up the heat. This is especially tricky in older houses, which may have poor insulation or single-pane windows that transmit cold air into the home. Besides simply bundling up (because who hasn’t heard that advice before? ), there are things you can do to keep your house warmer…and save a few bucks doing so, too. 1. Let the sun in during the day. In rooms that get ample sunshine, open the curtains and raise the blinds to let all that glorious light in and capture the free heat. Even when it’s cold out, the sun is still warm. The sun can help keep your home warm. 2. Close the curtains at night. Once the sun goes down, draw the curtains to trap all the heat you brought in during the day. If your curtains lean toward the airy, gauzy side, consider buying heavier drapes or insulated curtains just for winter use. They’re not solely for windows, either; covering up doors to the outside adds another layer of insulation. 3. Close off all unused rooms. According to the National Energy Foundation, as much as 10% of the heat in your home can be lost to uninsulated floors. That’s bad news for those with hardwood flooring, but area rugs (even blankets, in a pinch) are an easy fix. Psychologically, you’ll feel warmer simply by bringing these cozier elements into the room. 5. Clear your radiators and heating vents. 6. Check your ceiling fans. Just because it’s cold out doesn’t mean your ceiling fans should sit idle. Many fans have a “winter” setting that reverses the fan so it spins clockwise versus counterclockwise. Since heat rises, adjusting your fan to spin clockwise will help push all the heat back down into your rooms, which is especially useful for those with high ceilings. 7. Look for drafts in non-obvious places. You may have sealed off all your windows and doors, but don’t forget that drafts can sneak through even the tiniest of spaces. Make sure the flue is closed when your fireplace isn’t in use, and check for cold air coming through keyholes, letter boxes, cat doors and dog doors. 8. Turn on the oven.